The iterated bootstrap may be used to estimate errors which arise from a single pass of the bootstrap and thereby to correct for them. Here the iteration is employed to correct for coverage probability of confidence intervals obtained by a percentile method in the context of production frontier estimation with panel data. The parameter of interest is the maximum of the intercepts in a fixed firm effect model. The bootstrap distribution estimators are consistent if and only if there are no ties for this maximum. In the regular case (no ties), poor distribution estimators can result when the second largest intercept is close to the maximum. The iterated bootstrap is thus suggested to improve the accuracy of the obtained distributions. 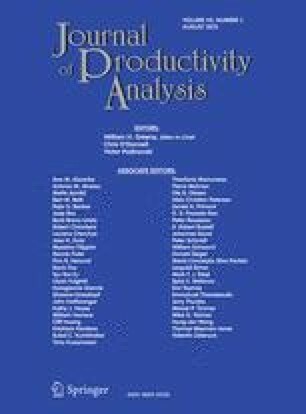 The result is illustrated in the analysis of labor efficiency of railway companies. This work was supported in part by grant No. 26 from the program “Pôle d'attraction interuniversitaire-Deuxième phase” to CORE and by the contract “Projet d'Actions de Recherche Concertées of the Belgian governement” (PARC) to the Institute of Statistics, Université Catholique de Louvain. The first author was partly financed by the Institut de Mathématiques Appliquées, Université Catholique de Louvain.